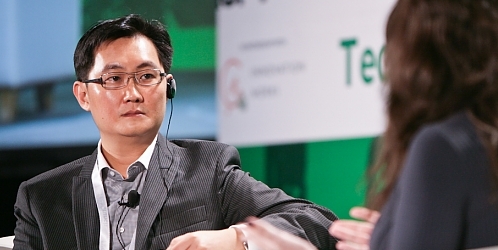 Huateng - better known as "Pony Ma" - is the elusive founder, chairman and chief executive of China’s titan tech firm Tencent. The 46-year-old magnate shies away from the spotlight, preferring to lead rather decisively from the shadows. Ma now sits atop the world’s fifth most valuable public firm, worth US$556 billion (£402 billion). Tencent is the collective answer to Facebook, Apple Pay, gaming, WhatsApp, Spotify and Amazon. Ma and his co-founders built a digital platform business from scratch over two decades and they have one of the largest data treasure chests on the planet to show for it. In 2017 Tencent became the first Chinese firm to pass the US$500 billion stock market valuation mark, overtaking Facebook. Yet few, in the West at least, have heard of it. Away from China’s firewalled internet garden, you can live quite happily on a diet of other digital services. Not in China. Analysts estimate that more than two thirds of the almost 1.4 billion population use Tencent. Its business roughly splits into three. First, the ubiquitous messaging app WeChat. Launched in 2011, when traditional desktops ruled and Tencent dominated online instant messaging with QQ (similar to Israeli tech company Mirabilis’s ICQ), cynics said it would cannibalise its own offering; that QQ and WeChat weren’t different enough, but Ma’s strategy paid off. From mobile payments to taxi hailing, users can live their lives on one app. Second, if you’re into gaming, chances are you’re playing on a platform owned by Tencent. It is the biggest mobile gaming franchise in the world, surpassing the revenues of Microsoft and Sony. Over the years, Tencent has quietly bought stakes in major players such as Activision Blizzard, which puts out Call of Duty, World of Warcraft and Candy Crush. Tencent’s third source of revenue is an ecosystem built around its one billion users. The firm supports a mind-bending number of apps directed at improving people’s everyday digital lives, including its own version of Uber, Didi Dache. So, it’s big. Is it a legitimate global player? Put the behemoth side-by-side with the likes of Facebook and Google and critics would argue that it’s an unfair comparison. The Chinese government overly supported Tencent as a fledgling firm, it benefits from Beijing’s block on Facebook, Twitter and Google, and, in return for help, captures ever more data, they would claim. Some would say it’s part of the government’s surveillance system - that through contentious "social credit" scores, Tencent can fill a gap in China’s financial system by taking a big-brother lens to citizens’ purchasing behaviour. China’s central bank, however, clamped down on the pilot in February 2018. Still, Tencent has surged ahead and left national rivals like Baidu behind. Owing to its continual innovation, it’s a fearsome competitor and has long sat at the same table as Western tech giants. So what can the rest of the world learn from the man behind it all? In 2006 Ma announced a five-year business plan: to reach annual revenues of 10 billion renminbi (£1.14 billion). The company’s 2017 annual revenues stood at almost 238 billion renminbi (£26.8 billion). By 2016, it employed 40,000 people, up from 1,000 in 2004. As the firm realised its rapid growth ambitions, Ma feared it would lose its nimbleness and become an overly complex, cumbersome giant. As organisations grow larger they often become insular and bureaucratic. Ineffciencies and inertia creep in. Employees become disengaged. So Ma created ‘Seven principles’ - agility, openness, user first, speed, resilience, evolution and innovation - to guide product creation. The Oxford Dictionary defines agility as the "ability to move quickly and easily", which is the foundation on which Ma built the business. How has he created the capacity to pivot in anticipation of and response to changes? By setting the right cultural tone. Speaking at the Tsinghua Management Global Forum in 2016, Ma pointed to Tencent’s early days as a classroom for culture. He didn’t want to lead, he said. He didn’t have grand ambitions to build a great enterprise. He wanted, simply, to create "excellent products" and have the co-founders see a return on their investment: "I focused on product and Tony Zhang focused on technology. Liqing Zeng looked like a boss and that’s why we asked him to take care of sales and marketing. Yizhou Chen originated from government, therefore he took care of HR, legal, administration and government relations," Ma explained. An important feature of Tencent’s dizzying success had been its ability to develop hot products quickly. But, as it matured, Ma felt the risk of the firm falling into bad habits weigh heavy. It was even risky, he thought, to rely too much on the founding team. He considered the next generation better positioned to dream up the next big product idea. "That’s why we allow those who understand the needs of younger users to do the job," said Ma. The launch of WeChat is a case in point. At an internal leadership conference, its creator, Xiaolong Zhang, put the product’s success down to simplicity and agility. Zhang regaled the audience with the tale of how, one night during the launch, he needed an urgent product change. He fired off an email and the next day a new software release was online. Changing a product in flight is tough. Agility was their ability to do it. As well as empowering younger employees to take the lead, Ma and his team put in place simple rules. Younger employees understand what people want. But they’re allergic to rules. Small firms that have grown rapidly, such as Tencent, have an advantage: they’re born agile. They don’t have to unlearn bad habits. Ma quickly discovered that it was his job to keep bureaucracy at bay. Unshackled by rules, Tencent employees have freedom to act - to invent, to problem solve, to wow. Teams also have freedom to compete. Ma asks people to "try bravely, without hesitation", which is how WeChat came about. In 2010 mobile use was skyrocketing: the surge was a new opportunity to exploit. Zhang emailed Ma asking for permission to create a competitor to Kik Messenger, founded in 2009 by a group of students from the University of Waterloo in Canada. Zhang was concerned that Kik or similar products could rival Tencent’s QQ. Ma gave Zhang permission to go ahead despite other teams, including QQ, plugging away on similar products. Zhang set up an autonomous unit in Guangzhou, away from the Shenzhen headquarters. By giving the project the green light, Ma, in effect, gave Zhang full licence to cannibalise the existing QQ product. On the back of ballooning mobile use - by 2012 China could boast that 89% of the population were users, more than in all European countries combined - WeChat soared. Many other tech firms, such as Facebook when it acquired WhatsApp and Instagram, have legitimised internal competition. Think of Apple’s iPhone, which rolled the iPod, cell phone and web access into a single device. As Steve Jobs, Ma’s idol, once quipped, "If you don’t cannibalise yourself, someone else will." Openness also means sharing. Ma quickly embraced open-source software. Employees share insights, software and entire bodies of code from other parts of the business. Amazon’s Jeff Bezos created a similar mandate in 2002. He required complete openness and insisted that all Amazon teams plan and design service interfaces so they can be exposed to developers in the outside world. "No exceptions," said Bezos. Creating back doors was a firing offence. It’s now vogue to call customers "users". But Ma’s early focus was on what he knew. A self-confessed geek who trained in computer science, he knew about the tech people wanted to use. His famous 10/100/1,000 rule reinforces Tencent’s user-first philosophy. Each month product managers run 10 end-user surveys, read 100 users’ blogs and collect user-experience feedback from 1,000 people. Ma also has sharp design insight. "A service starts with the satisfaction and needs of its users in mind and is defined by those two things," he wrote on WeChat’s internal platform in April 2017. He summarised seven deadly sins of product managers, saying that developers undermine their products by convoluting them beyond recognition: "Spending core resources and time repeatedly on the optimisation of the obvious characteristics is basically the mania of novice internet entrepreneurs." Regardless of age and background, users want clear, simple, natural, easy-to-use design and products. And with Tencent, that’s what they get. Unlike Western app constellations, Tencent combines as many features into one app as possible. Take the use of ID cards in China. In January 2018, WeChat launched a pilot digital ID scheme, allowing citizens to link their national identity to the platform’s facial recognition app. The innovation is the latest to integrate WeChat into people’s everyday lives - cementing its status as the app for everything. No product starts perfect. It takes rapid iteration and even then, according to Ma, perfection is never reached. Tencent’s attention to speed has long had its rivals green. For instance, the first major chat app in China wasn’t WeChat; it was Miliao, which was produced by Xiaomi. Xiaomi’s founder and CEO Lei Jun admitted that WeChat eclipsed his product because Tencent could release one or two versions every week. "Miliao could only release one version per month," he noted. "Even for software as complicated as QQ, they still maintained the speed of releasing two to three versions every month. Tencent’s people are in search of excellence." (sometimes unknowingly) work on variations of the same product lines, can create waste. But where there are losers, there are winners: Ma expects people to bounce back from losses, pick themselves up and start over. As for external competition, Tencent has experienced plenty. BAT - Baidu, Alibaba and Tencent - are China’s power gang. FANGs - Facebook, Amazon, Netflix and Google - preside happily over Silicon Valley. The battleground is vibrant. Facebook was banned in China in July 2009, the same year WhatsApp launched. Closer to home, in 2010 Alibaba blocked Baidu’s internet crawlers from its website. Alibaba and Tencent have repeatedly clashed over the same turf. Resilience is all part of Ma’s mission to face down internal and external attackers. You need resilience to keep you on the ball. "Evolution" at Tencent means the capability to improve, self-correct and stay focused. Sceptics of the BATs and FANGs of this world could argue that the internet made survival easy - even too easy. But Tencent came of age before mobile. Plenty of seemingly bulletproof businesses - Dell, HP, Kodak, Blockbuster - have lost their edge by failing to adapt. Tencent embraced mobile and moved with the times. Part of WeChat’s early success was its likeness to WhatsApp and Kik, designed for the smartphone. QQ and Facebook reigned supreme in the PC era and were modified to suit mobile. Ma sensed this threat: "Some say that mobile internet just means adding ‘mobile’ in front of the internet as an adjective, but I felt it was more than an extension. It was a revolution." Ma believes that innovation follows the other six principles - agility, openness, user first, speed, resilience and evolution. "Innovation is the result, not the cause," he says - but it is easier said than done in a firm as big as Tencent. Then again, innovation takes many forms. China’s giants are famous for plucking the best from the West and localising products for a home crowd. But imitation, when executed well, is a valid form of innovation. If Tencent’s success in the early 2000s - let’s call it Tencent 1.0 - was due to replication, that of Tencent 2.0 was down to incremental innovation. Red Packets are a good example. During the 2014 Chinese Lunar New Year celebrations, Tencent built on the ancient custom of giving red envelopes filled with money to boost traffic on WeChat’s mobile payments platform. With a click on a red envelope icon, gifts of money could be sent to friends and family. Neat. The idea was a watershed moment for China’s mobile market, bringing more than eight million users to Tencent’s WeChat Payment platform in the first eight days after the New Year. What about Tencent 3.0? It’s hedging its future bets. Under Ma’s guidance, it is shoring up its strategic options, investing in game-changing technologies set to be the next big thing. VR, AI - you name it, Ma is buying stakes in it. Tencent’s earlier efforts include investing in the US-based Snapchat. The firm also invested US$1.8 billion (£1.3 billion) in Tesla. Part of Ma’s deck-spreading strategy is to take Tencent worldwide, in line with the Chinese government’s One Belt, One Road national grand plan. By partnering with Silicon Valley’s favoured few, Tencent can enjoy exclusive invitations to the global party. Past attempts at breaking the international market alone haven’t fared well. WeChat hit most global markets in 2012. It launched with a star-studded push, featuring among others footballing superstar Lionel Messi, but marketing doesn’t work when the cost of switching is high. Established Western platforms such as Facebook are embedded in people’s crystal-screen portable friends. When something new comes along, customers think it’s usually best to stick with what they’re used to, unless it’s dramatically different. Ma has an ABC - AI, big data and cloud - expansion strategy. In 2017 Tencent opened its first data centre in Silicon Valley and announced plans for five more outside China. It has also partnered with Oracle as a way of expanding rapidly into software-as-a-service applications. These strategic partnerships are all options for future growth. Alternatively, Call of Duty or Candy Crush might be the vehicle that realises the global ambitions. As the biggest gaming company in the world, Tencent certainly has global reach, even if people don’t yet know it. The interesting question is whether it needs to go global. The internet sector in China is politically policed, but it is also lightly regulated. While its Western peers face further scrutiny on privacy, Tencent is less restricted. And let’s face it, with a market of almost 1.4 billion, the state economy is still ripe for the picking. Besides, Tencent has earned its premier status and, as long as Ma keeps pushing his principles, perhaps the rest of the world can adopt them as their own.